There has been some interesting dialogue over Twitter recently regarding what sort of images may – or may not – inspire future generations of young women to think about the STEM subjects and, in the exchanges I’ve seen recently, specifically engineering. What sort of poster girls work best and which just annoy? The argument seems to be that glossy brochures dreamed up by advertising agencies featuring, perhaps, young blond and well-coiffed women look too artificial to be convincing. But, as I’ve explored before, what ‘balance’ in imagery is really appropriate to promote inclusion? And in the flesh too, what kind of role models genuinely do ‘inspire’? Is it better to have someone just a few years ahead of you in the career trajectory or someone at the top of their game come and try to sell you their love of science? Does the latter merely intimidate whereas the former seem approachable and a plausible version of yourself in five or ten years? I worry about this a lot. I worry that if I go into schools to talk I just seem like a dinosaur with a gong to my name, rather than someone sufficiently similar to the pupils that I might be able to encourage them that going on to study physics might be attractive. I have had bad experiences of being met with stony silences, the potent sound of which I always worry is down to me seeming too remote, too inaccessible for pupils – particularly those coming from disadvantaged backgrounds for whom my Cambridge credentials may seem threatening rather than a positive. 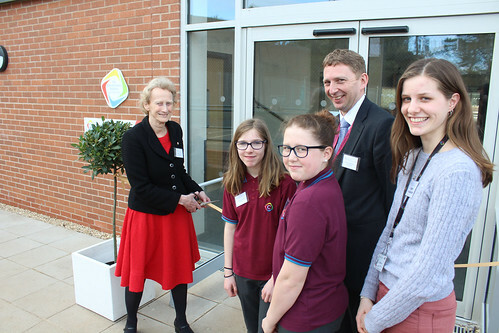 However, this week I was invited into a school in rather a different guise: as the person cutting the ribbon as their new building was opened, the building housing their science and technology facilities. The school had set up a competition to their year 7 and 8 pupils to research a woman in science after whom the building might be named, an original challenge and one well-placed to get all the pupils (male and female) thinking about women, science and why historically there have been so few women pursuing the STEM subjects. The final shortlist included Rosalind Franklin, Mary Somerville, Marie Curie, Anne McLaren – and me, as the headteacher’s blog of the school in question, Churchill Academy, spelled out. Churchill, as I discovered, is a village on the edge of the Mendips in Somerset. Wikipedia explains that the Churchill family name derives from this village. Two of the pupils, Polly Jones and Freya Hatherall (in the photograph above, along with sixth former Libby Scott who gave the vote of thanks, and head teacher Chris Hildrew), pitched to the panel making the decision about my career, and won. I was taken aback but very honoured when the school wrote to ask if I would be willing for the building to be given my name. It is pretty humbling. There are obvious resonances, such as the connection with the Churchill name. Less obviously, since food technology will be taught in the building, that I have worked on starch apparently also struck a chord. My final advantage over any of the other shortlisted women named above is, perhaps obviously, that I am not dead; I could actually turn up to cut the ribbon! And so I did this week. A lovely airy building, well-equipped courtesy of a grant they received from the Wolfson Foundation to go along with the capital money from the Council. I got a chance to wander round (and I couldn’t help noticing the name on all the doors: Donald followed by a number, which gave me a bit of a jolt too). And so to the title of this blog. As the photo makes clear, I was wearing red on this trip to Churchill Academy. And I realise just how often I do. OK, that particular dress has pockets, always useful if someone is going to lumber you with a microphone and something sadly lacking from so many women’s jackets and dresses, but I don’t think that’s the sole reason I wear red. I have long since given up any prospect of disappearing into a crowd at functions amongst grey-suited gentlemen (or blue-suited if you prefer) so I might as well consciously stand out. Red seems to fit the bill, though perhaps not along the lines of Chris de Burgh’s lyrics. But, and this comes back to imagery, does it matter what I wear? Am I too conscious of this or do audiences (particularly young audiences) really care? Thatcher was in some respects very feminine, particularly in the endless care she took over her clothes and complexion, but she was no feminist. She preferred to work with men, preferably men who behaved flirtatiously…. I hope flirtation is not in my professional lexicon and I don’t take ‘endless care’ over clothes, let alone complexion (as I said in my speech at Churchill Academy, I may have won the L’Oreal Laureate in 2009, but I am allergic to most cosmetics), but should I worry more if I want to inspire young women? Or am I just so old and irrelevant to most of them that they couldn’t care less what I wear? And what man ever had to worry about these things….? Image, as well as imagery, matters, as does inspiration. I wish I knew how to get this right. This entry was posted in Education, Women in Science and tagged Churchill Academy, clothing, inspiration, pockets. Bookmark the permalink. Thinking again about this, it looks almost as though I am trying to teach you, which is farcical. I was just challenged by your comments and thought about it. Lots of thoughts prompted by that. The first is that men do think about it (well this man does but maybe I am off the mean). I grew up in the 50s. I remember Lawrence Bragg doing Christmas Lectures. He was old and grey and dressed in grey, but then, so was everyone else. He didn’t bounce up and down with enthusiasm like a modern TV presenter, but the things he did were mind boggling. They certainly pulled me in. But that isn’t the issue is it. It is surely a mistake in any environment for mature women to dress as mature women did 30 or even 50 years ago. You certainly don’t want to look any less interesting than their grandma. My underlying thought, though, is that if it is clear that you want to lift them up to your level rather than impress them with how “great” you are, almost any look can be “rocked”. There is one other issue, though. Many years ago I was gobsmacked to hear a colleague (standing next to his wife) say, “Intelligent women terrify me.” There is a lot of it about. So one thing is never to allow anyone to put you down in the hearing of an impressionable audience. Whether the answer to that is to strike back or to plan ahead probably depends on the audience, but for sure it has to be tackled. And smile. Who is going to believe you enjoy life if you don’t smile? Thanks Laurence! Every path is different….